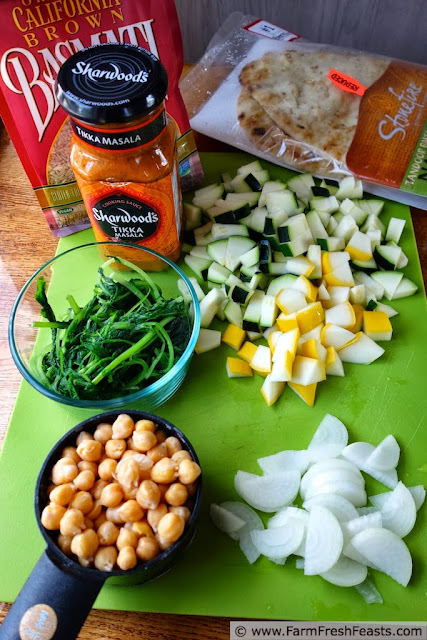 A quick vegetarian stew of sautéed zucchini and yellow squash with mustard greens and chick peas in a prepared masala sauce. Bring the farm share home and have supper on the table quickly. For other recipes using Mustard Greens, please see my Mustard Greens Recipes Collection. For other recipes using Cooking Greens, please see my Recipes for Cooked Greens Collection. For other recipes using Summer Squash, please see my Summer Squash Recipes Collection. These collections are part of the Visual Recipe Index by Ingredient, a resource for folks like me eating from the farm share. For other Greens recipe ideas from around the web, please follow my Greens board on Pinterest. I've categorized fast recipes on this site as Quick Takes, and before I discovered some wonderful Wednesday link ups I used to post fast recipes on Thursdays, because Thursday is one of the days that I'm running kids around right up until suppertime. However, I've been kicking around the phrase "Fast from the Farm Share" in my head for a while, so I'm going to share an occasional series of recipes that can get on the table quickly using ingredients from the CSA farm share (or your garden, or the farmer's market, or grocery store). You'll notice I'm relying on a prepared sauce for this stew. Sure, I can make my own masala (with chicken and chick peas here, or with patty pan squash and ground beef here, or with sweet potato, chicken, and chick pea here) but those are slow cooker recipes which don't fit with the fast theme. This recipe is for those nights when you've got fresh vegetables that you need to eat and no time/desire to think about what to do with them or make some elaborate concoction. It comes together quickly (cooking the rice takes longest, so if you've got the option, I'd set up the rice cooker before work, or have a kid start the rice cooker after school, or buy precooked rice) and tastes wonderful. And my kids snarfed up the mustard greens very quickly this way (magical naan, that is) so that's a win in my book. Preheat a large skillet over medium heat. If you've got naan, preheat the oven as well. Add a turn of cooking oil and when it's shimmering add the onion to the skillet. Sauté 3 minutes until the onion starts to soften (I'm chopping squash while this is happening) then add the squash and stir to coat with oil. Continue to cook until the squash is starting to get a bit of brown color, another 5-8 minutes. Add in chopped mustard greens and chick peas and stir. Pour prepared masala sauce over all the vegetables, stir to combine, and let heat through (another 5 minutes or so. 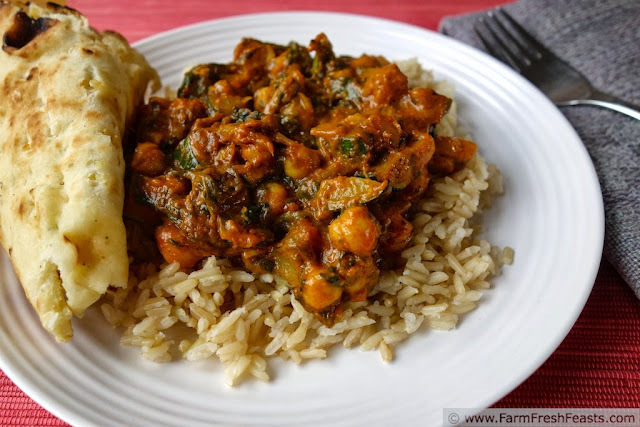 Serve over rice and alongside hot naan, if desired. For some chutney inspiration, Laura at The Spiced Life has terrific ideas here. NOTE: If I receive a bunch of cooking greens in the farm share I will frequently cook them at the same time. I was boiling water for a pasta dish and briefly boiled the mustard greens for this dish (more than a blanch, though not a full on boil-until-death, about 4-5 minutes), then briefly boiled the chard for the pasta dish, then boiled the pasta. I stored the mustard greens in the fridge until I was ready to use them the next day. I'd eat this. In fact, I'm going to add a jar of prepared masala sauce to my grocery store list this weekend. Quick and easy is right up my alley these days. As a matter fact, I asked for quick and easy advice on today's blog and sure enough, you delivered. 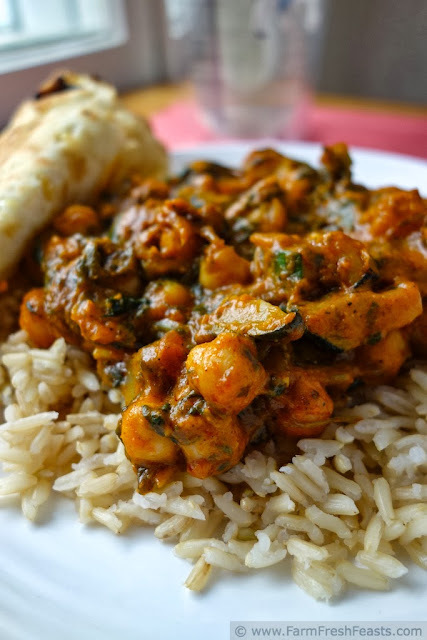 You're magic, right along with the naan. My next piece of advice is to roast a vegetable *and then* stick it into a grilled cheese sandwich. The veggies could be roasted on the weekend, and then the grilled cheeses slapped together whenever. Not as amazing as your blueberry grilled cheese, to be sure, but altogether worth doing. Two Peas and Their Pod shared a roasted broccoli grilled cheese recently, from the cookbook Bountiful. Ooh, this sounds SO good - what a fresh, simple, delicious meal! I know when the kids fight over the leftovers that it is a winner. And so easy! Thanks! Love this - would be perfect for lunch today! I even have mustard greens in this week's farm share. I'm glad you shared that with me--I'd love to learn more, and having a name to search always helps. Thanks for stopping by! This looks like such a comforting plate of food --yum! I like a nice, comforting plate of food, too. Thanks for stopping by!